Garran Holt is a troubled young man. 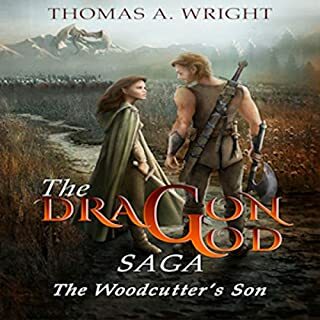 Unable to tolerate his self-destructive ways, his mother sells him into indentured servitude as part of work crew building the King Remiel’s new trade road. When mercenaries sent to disrupt the road’s construction attacks his work camp, Garran discovers an inner power capable of turning him into a warrior of unparalleled ability. Recognizing Garran as being one of the transcended (a fighter able to slip into the swifter currents of time), he is trained as an agent, one of the kingdom’s elite spies. Crude, abrasive, and deeply committed to destroying himself with drugs, alcohol, and debauchery, Garran might be the kingdom’s only hope against falling to The Guild, the powerful trade cartel bent on becoming the true and undisputed power in the land. 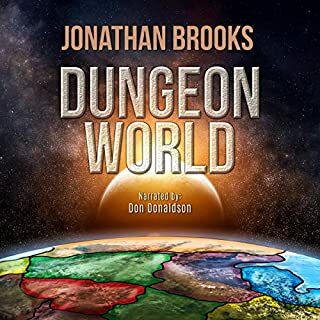 We have enough disgusting characters in Washington including the White House so why not in a kooky wild Audio Book. In a strange way we get used to the awful main character and begin to be absorbed in this unusual story. The Narrator makes it all happen after all it is a Audio Book. Deskins pens a pretty messed up story with the Miscreant, but I do not mean this in a bad way. He is very unapologetic for what he writes, and the way his character behaves. It is very refreshing to see a REAL sociopath as a main character. I had read the Dexter novels, but they still tried to pawn off the badness in the man to his Dark Passenger, and he had an inner struggle that made him sympathetic. Not here. The book is funny, and in no way does it try to improve the main character. He is a letch that is interested in self fulfillment and utter debauchery, and he makes no qualms about behaving as he pleases. This wouldn't be so bad, but Garren is Transcended, which means he has powers few others have, and he is forced to fight for his homeland in spite of his wishes. Too bad, so sad they are depending on such and A hole to be their savior. This book is not for everyone. There will be some whiney sniffling cry babies who cannot stand he things that happens, and they need to stay away from this book. Away as in restraining order distance. But, if you love craziness, action, and all kinds of debauchery then this is, without a doubt, the book for you. Arquin, btw, does a great job narrating. He is quite skilled, and carries the story along without a hiccup. I see a lengthy career for him in this industry. Get this book, and be prepared to go on one wild ride. Just don't expect any apologies. "Trust me, I'm always right". Garren is such a jerk sometimes, but you can't help but love him. You'll be laughing out loud or smiling thru most. Gotta love a guy that is smart enough to skate thru life's bumps and come out on top. Is it real life?, No, it's fantasy, and a great one. Would love to see Cyril show up again, such a great character. The narrator did a wonderful job creating the different voices, and the one for Garren was perfect. This is my opinion only & should be considered with others as a whole.This audio was given to me free at my request & I made this review voluntarily. Thank you for the opportunity. The main character is pretty juvenile a little overbearing, but he's also very funny. This book splits the line between funny and serious, leaning more toward funny. The narration took some getting used to at first, but overall it suits the story. The pace was good. The accent that some other reviewers complained about didn't bother me. If this is to become a series about the Transcended, then this first book is definitely the origin story of its main character. The publisher's summary of course spoils a very important plot point - Garran Holt's special powers as a Transcended - which in hindsight was a bummer for it made me think this would be a main plot point throughout the story. However, if you put your expectations about this Transcended phenomenon on a low burner and instead settle in for a fun ride following the adventures of the title's 'miscreant', then you'll have a great time listening to this book. It had me laughing out loud a few times, which is not only because of the fun story but also thanks to the narration. The narration for me was an acquired taste. 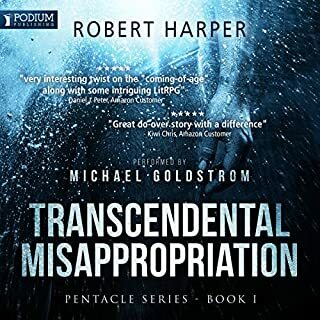 I hadn't expected the heavy southern American accent the narrator chose for his main characters, and combined with a somewhat sharp and high-pitched voice it almost made me put the audio book aside and buy the ebook instead. However, I decided to give it a few more chapters, and at about chapter 7 my brain had apparently adjusted to the narration for I no longer found it irksome. In fact, I actually started appreciating the committed voice acting of the narrator, and the way he made his characters cry out "Ow!" was hilarious and very believable. All in all this was an entertaining listen and I'll definitely keep an eye out for part 2. GREAT book, well worth a credit! This is a quite enjoyable and well written/narrated book. It has a very unique approach to the coming of age, royalty versus guild story structure. Not to mention the great dialog. All in all, this is definitely a book worth checking out. Story line has you rooting for the main character, though they’re not the sort decent people usually acquaint themselves with. Not recommended for children or teens as main Character is a bad role model. Situations are well thought out by author. Very inventive! 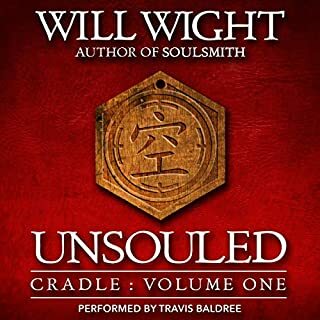 “I was given this free review copy audiobook at my request and have voluntarily left this review." Although the King’s vs guilds story line isn’t new the paths that this story takes is. Our hero starts life like any other hero poor, destitute, and mistreated, but that where the comparisons end. This hero isn’t afraid of getting his hand and anything else dirty to get where he wants to be. Overall it was and interesting and entertaining story with lots of abuse and debauchery. The narrator was good and very well read, but a couple of his character were kind of annoying to listen to. That wasn't a compliment! Are you suuuure? Disclaimer; "This book was given to me for free at my request and I provided this voluntary review." . -> However, I will most certainly purchase the second book in this series, and here is why! I will start out with the narration, since this almost prevented me from listening to this book. The first 10 minutes or so I could just not get used to this narrator, I honestly thought it was horrible. It seemed however, that the narrator was perfect for this book, and I just needed to get used to it. After listening for about half an hour I was used to the narration, and also I appreciated it for what it was. So, if you have some reservations concerning the narration; Don't! It only gets better! The story itself is kind of a 'coming of age' story, but not really, it is kind of a 'MC goes to college' story, but not really.. It isn't a fantasy, spy novel, medieval novel, it actually isn't definitively anything, and yet it is everything.. Our MC takes us all over the place in this story, and I really think it has something for everyone. Finally, what makes this book worth your credit/money? Because that is the real reason you are reading this review. Well, the MC is the main reason you will love this book.. The main character is an over the top smartass. Don't get me wrong here, he isn't a loveable cute smartass who always does the right thing. The MC is a smartass of unknown proportions who has no problem crossing the line between good and bad. In fact, for our MC, there probably isn't a line at all, you just be you, and I'll be me! One of the things I loved the most is also in my headline for this review. The MC will have done something that is just too over the top for other characters, and out comes a line like; You are a real devious scumbag you know that? to which our MC replies with 'Ooh thank you!' ..'That wasn't a compliment!' 'Are you suuure?' ..
All in all, I give this a 4 star rating. It is a very good book, most certainly worth your money, and I will most certainly buy the next one in this series. 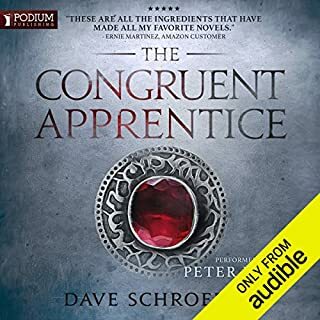 Where does The Miscreant rank among all the audiobooks you’ve listened to so far? Garran. Everything he did was so totally wrong. Which character – as performed by J. S. Arquin – was your favourite? This was a humorous anti-hero type book. Garran did absolutely everything for the wrong reason and was full bore selfish and self serving. He abused his body with drink, drugs, and women and refused to take responsibility for his actions. His only salvation was that he was that he was a Transcended who could swim the tides of time and extremely rare. The entire book was about him flouting every authority and still managing to survive. His antics were funny but really sad at the same time. Great read and worth the time. 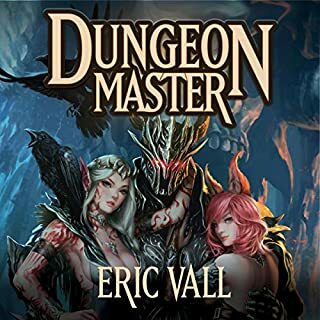 This is not the first series I have listened to from this author and just as he did in the first book of the Sorcerer's Path series, he took some familiar fantasy novel plot elements and then proceeded to give them an interesting twist. The main character of this book is a young man called Garran Holt, he is a fairly charismatic character who seems to be on a path of self-destruction, be it from drink, drugs and debauchery or simply from his self-centred nature being destined to eventually lose him what friends he does make. The pacing of this book helps to keep things interesting with the author choosing to not linger on a particular element such as his time at the work camp or his time at school any longer than is necessary for that part of his development, which makes sense when the underlying conflict between King Remiel and the Guild would not really suit a young teenager, no matter what gifts he has due to his nature of being one of the Transcended and it is this conflict that seems likely to occupy subsequent books in this series. The narrator gives a good performance overall with the main character seeming to fit his performance and the supporting cast being given distinctive enough voices that were appropriate to the class you would expect. This was an interesting start to a series with a strong main character and it definitely drew me in enough that I would want to see what happens next in it. Well I truly loved this book. 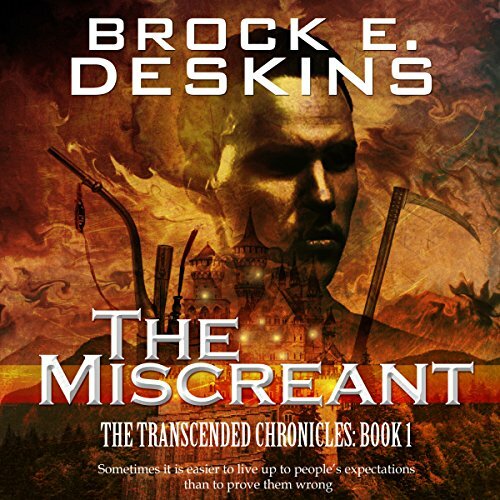 Brock E. Deskins has written this book in a manner where the story flows effortlessly throughout, it was a pleasure to listen to each chapter and it left me wanting to know what was going to happen next. Garran aka ‘The Miscreant’ is a most delightful rogue who has a knack for ending up in the all sorts of trouble and mischievous circumstances. He has a total disregard for all authority and their rules, he actually enjoys breaking them causing mayhem and havoc in his wake. He is scheming, calculating, devious and at times debaucherous too. Yet beneath his care free exterior you know he has a good heart. This book sets the scene for his future adventures by explaining where he comes from, the difficulties that he endures and overcomes, although it has to be said that many of which are the consequences of his own nonchalant actions. During his journey he makes friends, meets mentors and outwits enemies as he battles to control and develop his special power to transcend. J.S. Arquin does a most amazing job of the narration. He delivers it in an easy to listen style with a myriad of magnificent voices. I’m so looking forward to listening to the next book of Garran’s adventures in The Transcended Chronicles. A wonderfully surprising book. Misdeeds abound. This book builds from the start and just keeps going. I never really liked the main character but loved how the author has purposefully pushed the lesser side of the character to make you dislike him whilst still admiring his ability to continue to thrive and survive in the most ingenious, morose and often despicable ways. The book has twists and turns aplenty, elements of mystery, thriller whilst all wrapped up in a fantasy world. All of the characters are well developed and grow over time through the story. Lots of unanswered questions but none that really spoiled the story for me. The narration is good with nice distinction of characters and strong performance for tone and effect. It is immersive and adds to the story. This book is great for someone wanting a strong antihero story set in fantasy with humour throughout without actually trying to be funny or clever. I was given this free review copy audiobook at my request and have voluntarily provided this unbiased review.